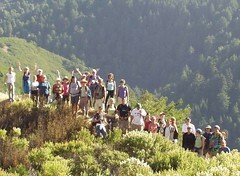 Playing big and going deep on the intimate edge in Big Sur. Sponge-like and awake while doing the hokey pokey, I am sure you can still hear Mary saying, "Don't go back to sleep, don't go back to sleep." I sincerely hope each of us are able to take some essential seeds from our time together and grow them to fruition. May you alway choose the path of aliveness.